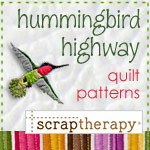 Let me introduce you to a new member of the ScrapTherapy printed fusible interfacing family! 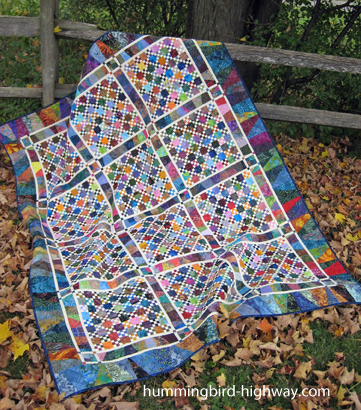 The ScrapTherapy Mini Scrap Grid was developed to make “99 Bottles,” the cover quilt from ScrapTherapy, Scraps Plus One! With all those tiny 9-patches in the quilt (492, to be exact), it seems appropriate to have an easier, more stable way to assemble them. But the Mini Scrap Grid is too wonderful to be reserved for only one project. Although it looks a lot like regular watercolor grid interfacing, it is a specific tool with a specific job–to make 9-patch blocks that finish to 1-1/2” square. 9-patches, that’s it. Nothing else! But the possibilities for 9-patches are endless! 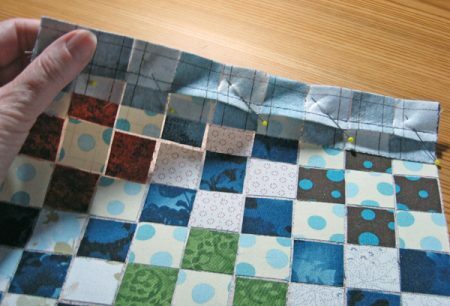 The interfacing, which is printed by Quiltsmart, comes in panels. Each panel will help you make 54 miniature 9-patches. 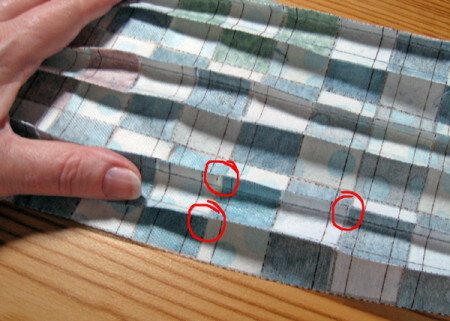 To make it easier to sew, the panel is broken into six sections. Each section yields nine 9-patches. 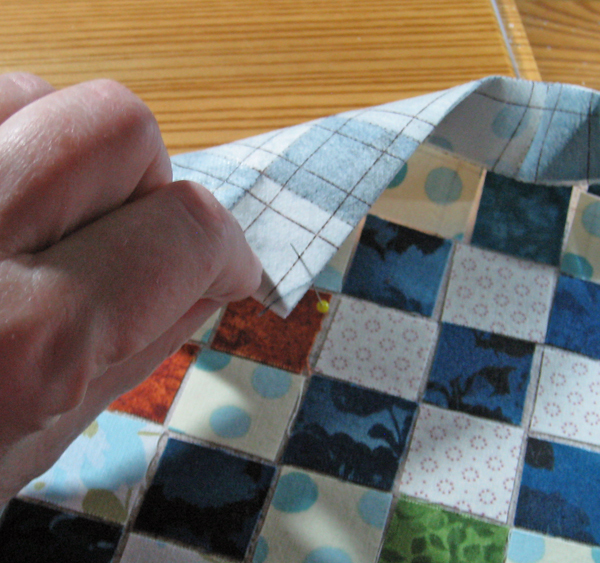 The more 9-patches you need, the more interfacing panels you need to make the project. 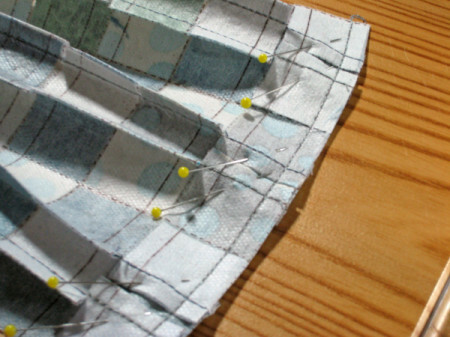 First, the interfacing has three different kinds of lines. 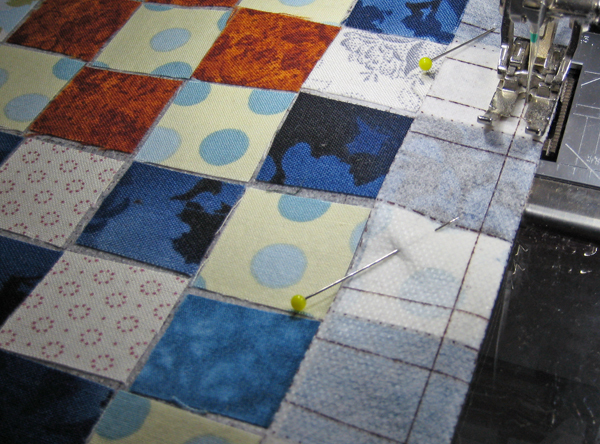 Dotted lines for aligning 1” fabric squares, and folding cues. 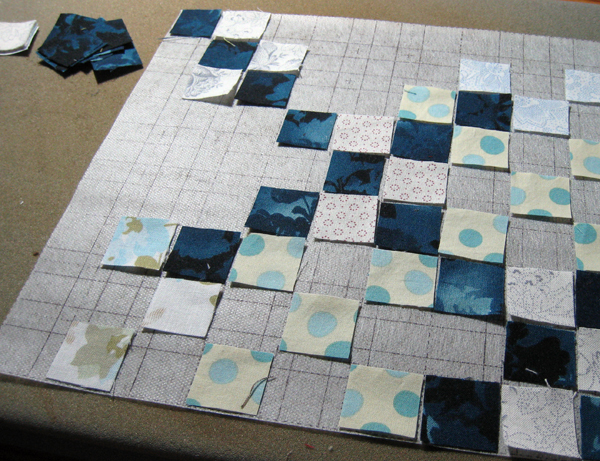 Dash-dot lines for cutting apart the miniature 9-patches. Cut apart the panel so you have one section of nine 9-patches. 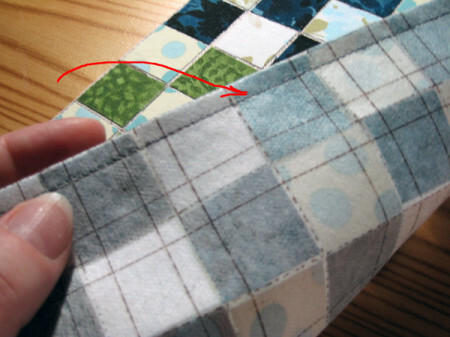 The panel has a little breathing room between the downsized sections, so be sure to cut off any extra interfacing to avoid getting fusible material on your iron once you start fusing. Arrange the scraps. 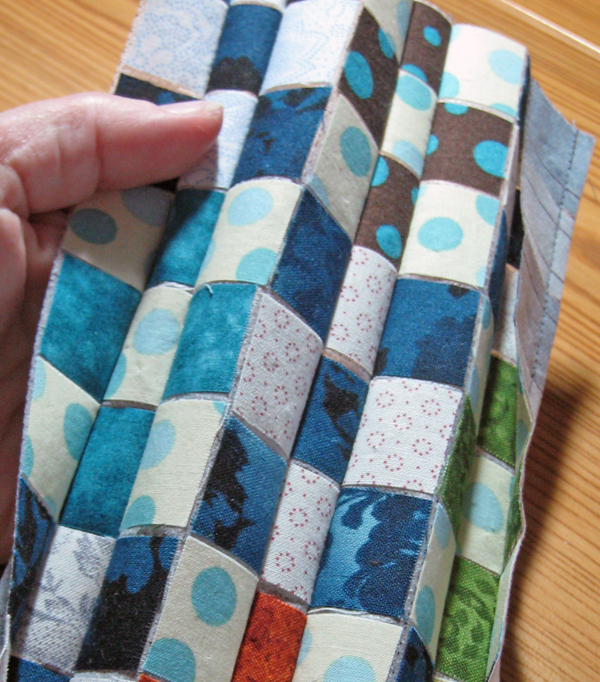 As you place the scrap squares, don’t look at the interfacing as one big 9 by 9 postage stamp block. 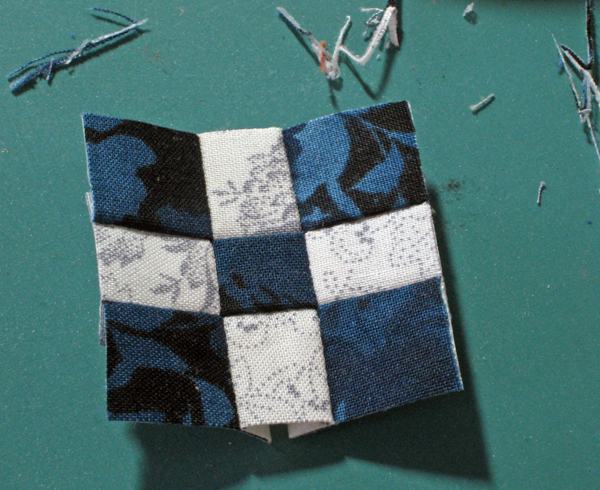 Look at each little mini 9-patch section as a block by itself. You might have similar fabrics next to each other from 9-patch to 9-patch, but that’s okay since they’ll be cut apart before they’re sewn into the project. 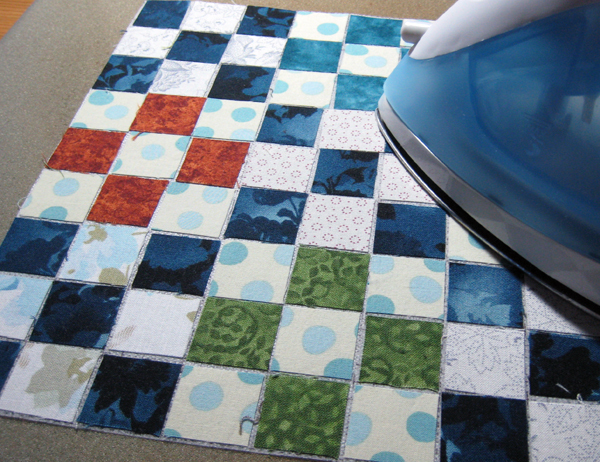 Fuse with a medium-hot dry iron with a lift-and-press motion. If you must use steam, only add a little puff! 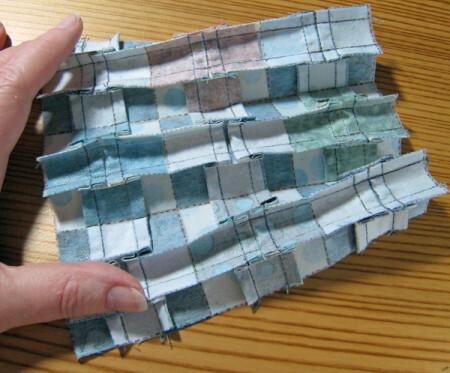 You don’t want to shrink the interfacing! Fold on the first dotted line. 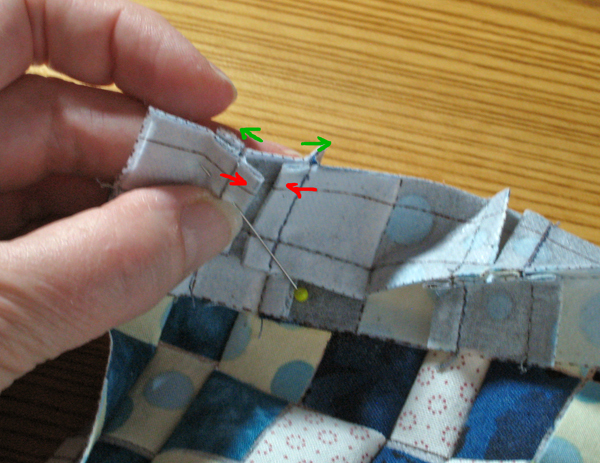 With the stab of a pin, check that solid sewing lines are aligned front to back, then pin across the fold to secure it for sewing. See? The pin is right on the line on front and back! 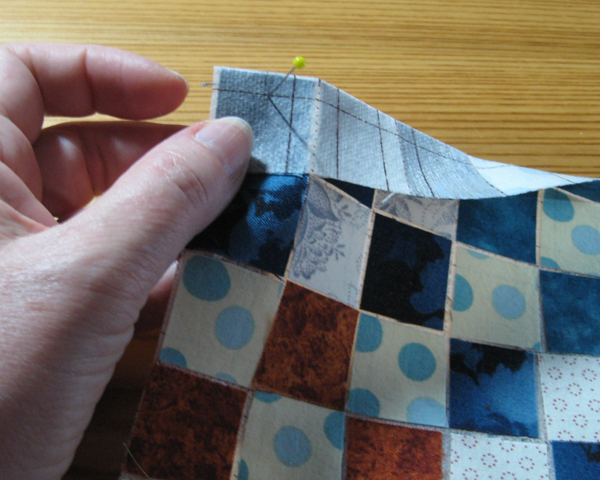 Pin along the fold, then sew on the solid line. Double check to make sure the seam and the line are one and the same on the front and the back. 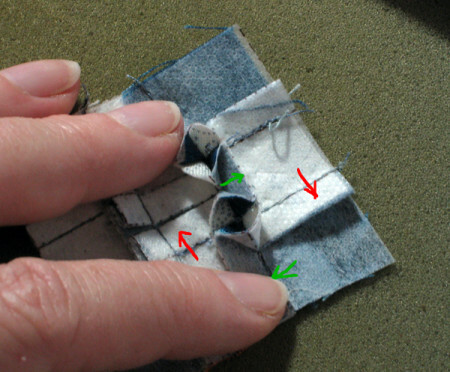 Open the sewn seam and fold on the next line. Keep folding, pinning, and sewing until all horizontal seams are sewn. That’s six horizontal seams. 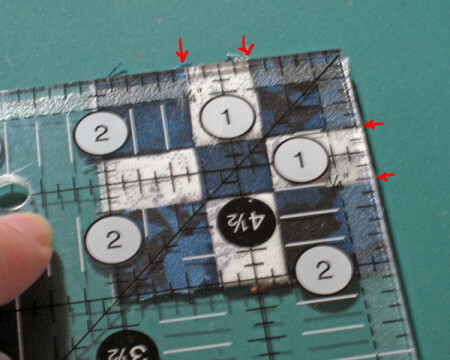 Notice that there are no seams between the mini 9-patch units. Here it is from the back. Clip the seams at the cross hairs. (Remember those little plus (+) marks?) Be sure to clip just past the seam. Some people get nervous about cutting past the seam, but it’s okay. This will help you oppose the seam allowances to reduce bulk at the seam intersections. Clip all of them – 6 per row in each of 6 rows. Be careful NOT to clip on the solid lines. That will create a visible hole in the 9-patch which is not a good thing. Here is a close-up of clipping the little cross hairs with scissors. 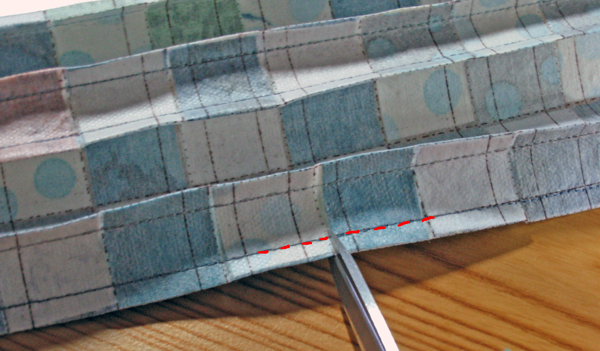 The red dashed line is the sewn seam. Notice that the scissors are poised to clip just past that red dotted line. Rotate the whole she-bang 90˚. Fold on the first dotted line. And oppose the seams. Make ‘innies’ on the front (seams pressed toward each other in red) on the front, and ‘outies’ (seams pressed away from each other in green) on the back. Or, you can do outies on the front, and innies on the back. 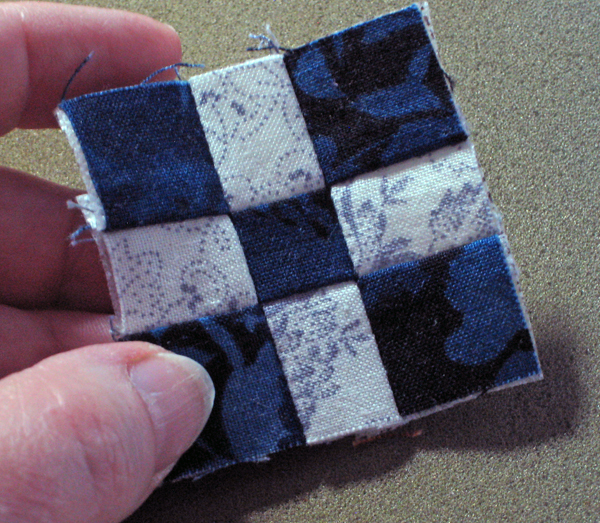 Doesn’t matter which one is where, just make sure you have innies and outies for each set of 9-patch seams. You CAN press the seams all in the same direction in front, and the opposite direction in back, but that makes things a little more complicated later. Place pins at the seam intersections to secure them for sewing. Stab through the lines just like before to make sure they are aligned front-to-back. Sew on the solid line. Repeat with the remaining 5 vertical rows. See? The stitching is right on the line! Once all the seams are sewn, you’ll see exactly where it wants to be cut apart when you place the 9-patches on your work table. 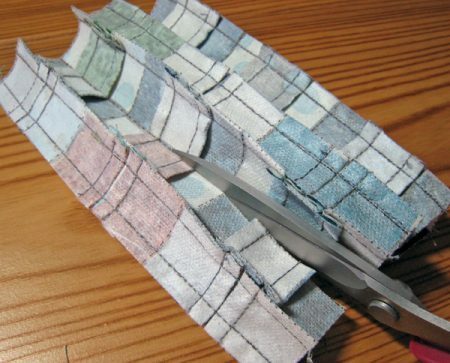 Cut on all the dot-dash lines with a rotary cutter or with scissors. You know how much I love to furl my seams, right? I bet you think it can’t be done when there’s interfacing involved. I thought so, too, until I tried it. 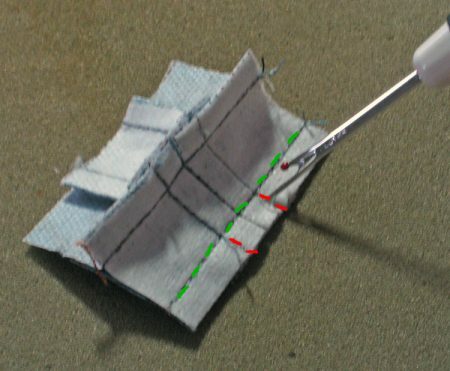 Start by removing the stitches (shown in red) on the front and back of each seam, don’t go past the longer seam in green. Do this with both sets of seams on the mini 9-patch block. 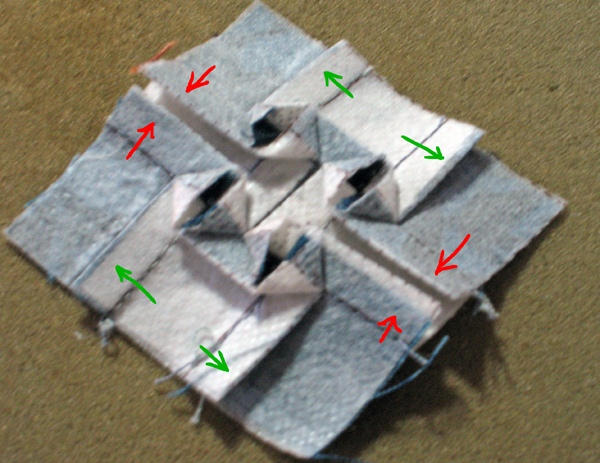 Place the 9-patch right side down on the ironing surface and open only the center of the seam. 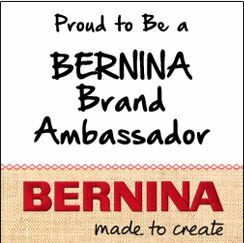 Notice that it makes a little cup-like or triangular shape–like the newspaper hats we used to make when we were kids–so it looks like this. And press. You want to have a set of innies (red) and outies (green) on each mini 9-patch block, especially if you will be sewing the blocks next to each other in your project. This furling thing only works if you pressed the vertical seams in the innie and outie configuration discussed above. 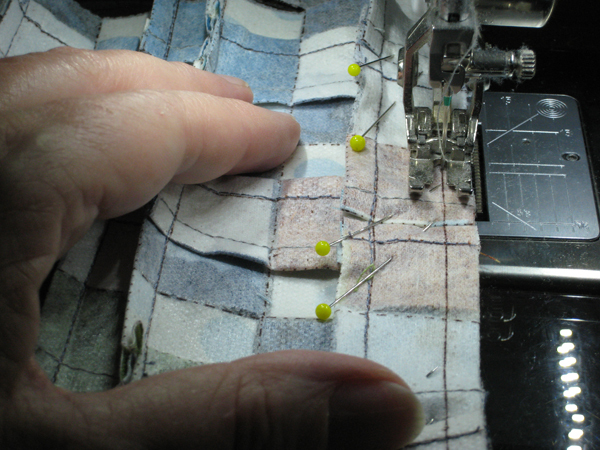 If you didn’t do the innie/outie thing, don’t worry, just press the seams in one direction, and remember the innies and outies for next time. It makes the little 9-patch lump-free. Once the 9-patch is pressed, it should be just a tiny bit too large. Trim it to 2” square. Be sure to trim all four sides. Notice where the seams line up with the markings on the ruler, each seam should be 3/4” from the edge and 1/2” away from each other. If they aren’t, you just need a little more practice! You’ll get it! Now you’re ready to sew the 9-patch into your project!